The downgrade: let the elections begin! A quick update on two releases today. 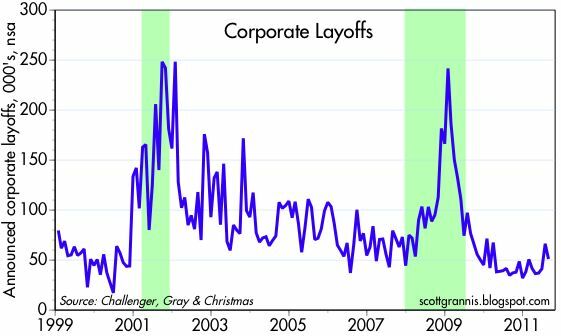 The August Challenger tally of announced corporate layoffs reversed some of its gains in July, while still remaining firmly in territory consistent with ongoing growth and, at the very least, no double-dip recession. 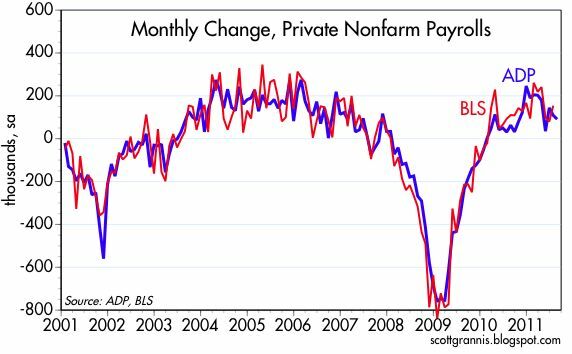 The ADP estimate of new private sector jobs was a bit below expectations, but still points to gains in private sector payrolls to be announced this Friday on the order of 100K or so, as is currently expected. I would note, however, that since the beginning of the current recovery, the ADP estimate of private sector jobs has lagged the BLS estimate by some 500K jobs. 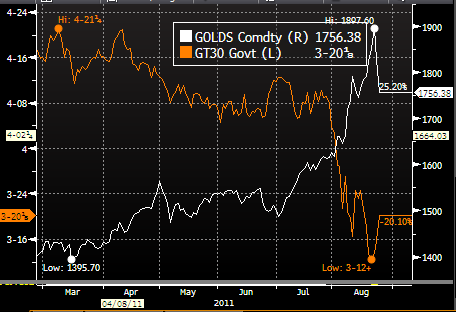 So if I had to bet on whether the BLS number will be more or less than expected, I would take the over. In any event, given the pessimism that seems to be rampant these days, we are probably overdue for some positive surprises. I'm not trying to be a cheerleader for the economy, since I'm very much aware of all the headwinds out there. But I can't help posting this chart and commenting on the strength of factory orders, especially now that the world has adopted a very gloomy view of the outlook for the U.S. economy (as embodied in record-low 0.9% 5-yr Treasury yields). New orders received by U.S. manufacturers rose 2.4% in July, more than the consensus expected. Orders are up 13.9% over the past year, and they are up at a very strong 15.5% annualized rate year to date. To be sure, orders are still below their pre-recession highs, but at this rate we'll see new highs before the year is out. There is no denying the manufacturing sector has experienced a V-shaped recovery, even though there is still plenty of idle capacity remaining to be utilized. It's been a slow recovery overall, but it remains a recovery nonetheless. And for good measure, I'll add this chart of commodity prices (a diversified basket of 27 commodities including energy, industrial metals, precious metals, agriculture and livestock), which shows a pretty decent 8% rebound from the recent (August 9th) lows, and prices which are only 5% off their all-time highs. Together, these charts strongly suggest that the pessimism has been overdone, and the talk of a double-dip recession is misplaced. 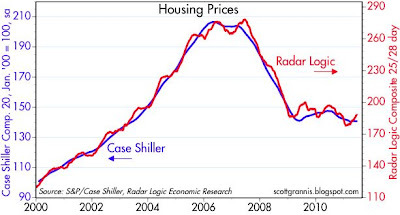 This chart compares the Case Shiller index of housing prices in 20 metropolitan markets to the RadarLogic index of prices in 25 metropolitan markets (measured on a price per square foot basis). Both are doing a remarkable job of tracking each other, so it's unlikely that they are missing something important. 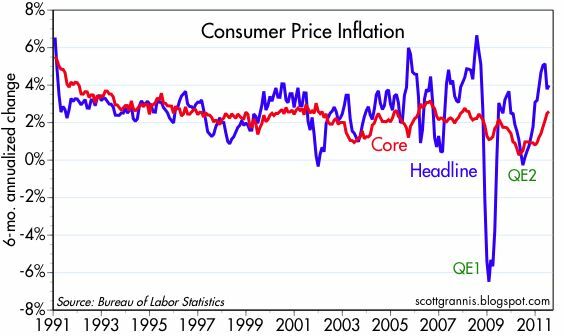 And according to both, prices have been essentially flat for the past two years, after falling by about one-third from their 2006-2007 highs. This next chart shows the Case Shiller index of 10 major markets, with data going back to 1987 and adjusted for inflation. Here we see that prices have fallen some 38% from their 2006 highs, and have lost a bit of ground in the past two years. The housing market has undergone the most painful and wrenching adjustment imaginable. Prices fell by an order of magnitude early in the crisis, but have managed to hold relatively steady for two years. The excess inventory of housing is declining daily, since new home construction today is only a fraction of the levels that have prevailed for many decades, and less than what would be needed to keep pace with new household formations. 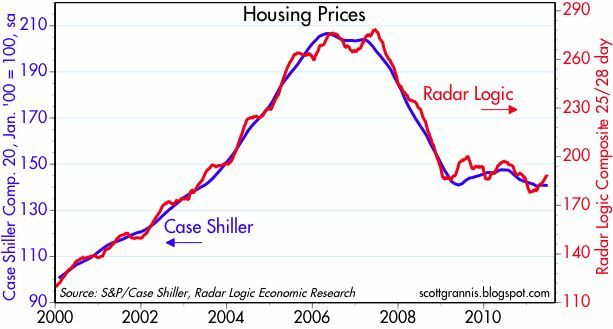 Perhaps the rebound in housing will take longer than many, including myself, have expected, but surely by now we can rule out another collapse, can't we? The next surprise in the housing market is likely to be a growth and rising price story, rather than another tragedy. 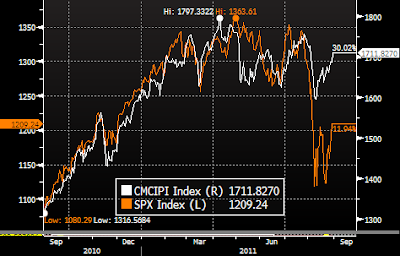 This chart compares Bloomberg's Constant Maturity Commodity Index (white line) to the S&P 500 Index (orange line). From last November through April, these two indices were almost perfectly correlated, suggesting that both were reacting to the same economic growth fundamentals. The correlation broke down over the past month or two, however, as equities were overcome by fears that a collapse of the Eurozone banking system could have serious repercussions for the global economy. Commodities initially shared in the onset of panic, but have since bounced back, and today are trading a little above their average for the year to date. 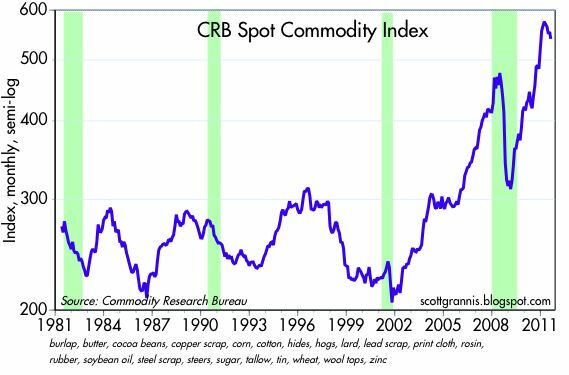 The action in the commodity markets suggests that the economic growth fundamentals have deteriorated much less than the behavior of the equity markets would suggest, and that the fundamentals have actually improved in recent weeks. This is an important development, of course, since growth can trump lots of problems. The Eurozone is far from conquering its sovereign debt problems, but commodity markets suggest that there is at least some concrete hope for a solution. On a six-month annualized basis, using the Fed's preferred measure of inflation (the Personal Consumption Expenditures Deflator), both headline and core inflation are above the Fed's target range of 1-2%. As recently as late last year—about the time that QE2 got underway—both measures were below the Fed's target range. 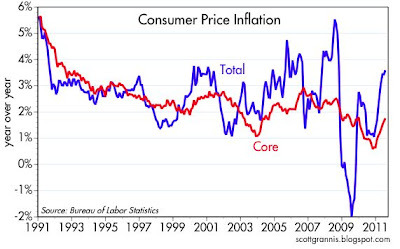 We're now back to a 2-3% inflation environment, much as we were in the years leading up to 2008. What has changed so much since late last year? 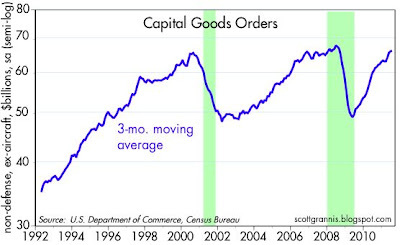 This second chart gives us a clue: durable goods prices are no longer deflating. In fact, durable goods prices have risen at a 1.2% annualized rate since the end of last year, and that's the first sustained rise in durable goods prices since 1994. The seemingly relentless decline in durable goods prices was a major factor holding down overall inflation for the past 16 years, but that's no longer the case. 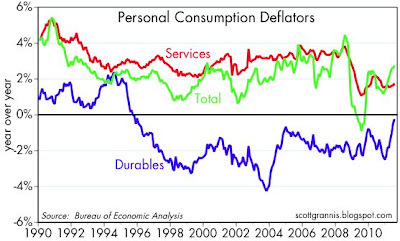 The above chart shows the three major components of the PCE deflator: services, nondurable goods, and durable goods. 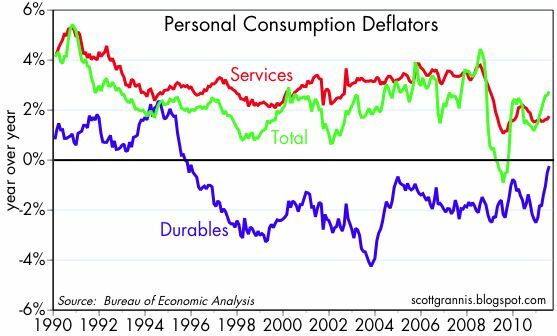 Note the dramatic differential between the rise in service and non-durable goods prices, and the decline in durable goods prices. 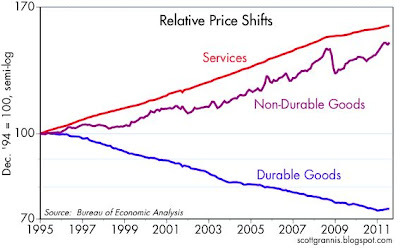 Since the end of 1994, service sector prices have risen 57%, nondurables have risen 47%, and durables have fallen by 27%. 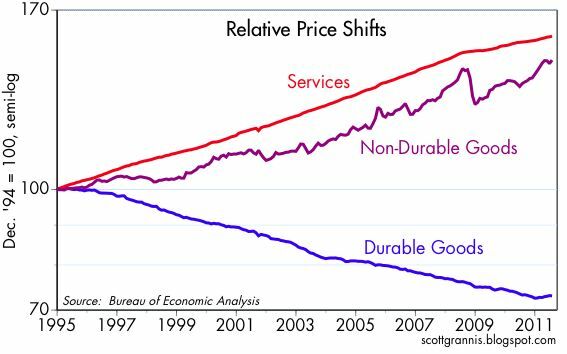 Since 1994, service sector prices have more than doubled relative to durable goods prices. Since service sector prices are dominated by labor costs, that's roughly equivalent to saying that an hour's worth of work today buys more than twice as much in the way of things (e.g., autos, TVs, appliances, computers) as it did 16 years ago. That's a unique, and for most folks, a very fortuitous development, since prior to 1994, durable goods prices never declined on a sustained basis. Unfortunately, those good times look like they have come to an end. 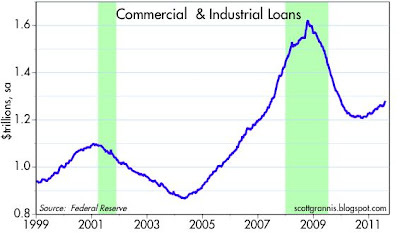 The good news about bank lending just keeps on a comin'. I've been featuring this chart for most of this year, and regularly get comments that challenge its message. Despite the popular perception that banks aren't lending, and despite the fact that many small and medium-sized businesses can't seem to get their bankers to lend them some badly-need money, banks are nevertheless expanding the amount of loans to small and medium-sized businesses, as this chart shows. C&I Loans outstanding have grown at about a 10% rate since late last year. The important thing is not that more loans are going to create more GDP, it's that more loans are the result of an increased desire on the part of banks and businesses to take on more risk. Risk-aversion was one of the things that contributed significantly to the 2008-9 recession, so a move towards less risk-aversion is likely to help the economy improve. 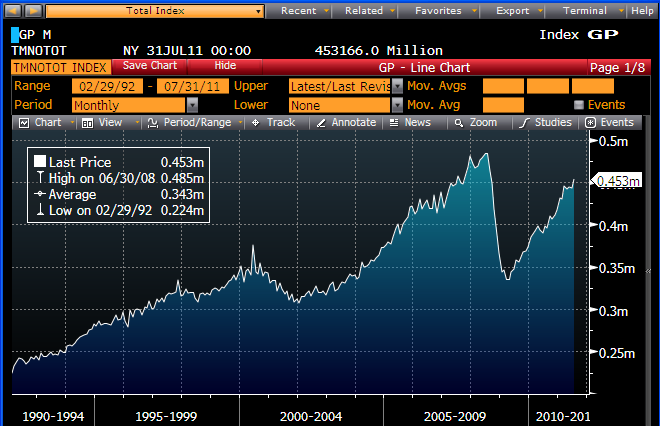 To put things in context, though, a 10% increase in this type of lending only amounts to a drop in the bucket. Banks are sitting on $1.6 trillion of excess reserves, which means they could—if they wanted to, and could find willing borrowers—expand their loans by many orders of magnitude more than they have to date. Corporate profits are fantastic—what's wrong with equity prices? Today's revision to second quarter GDP brought with it our first look at corporate profits, and they were once again very strong, if not fairly spectacular. 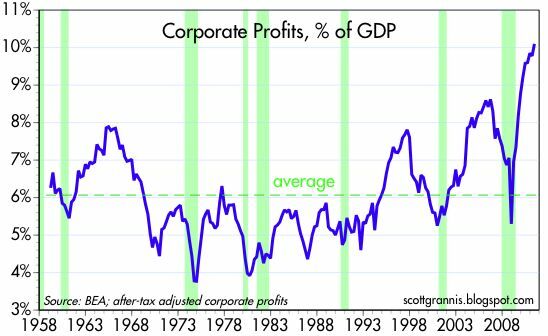 Not only were after-tax profits up over 9% relative to a year ago, corporate profits are now at an all-time record high of 10.1% relative to GDP. We've never seen anything like this. So the question that absolutely begs to be answered is this: Why haven't equity prices kept pace with the huge increase in corporate profits? After-tax corporate profits averaged $554 billion in 2000, and the S&P 500 index averaged 1423 that year. 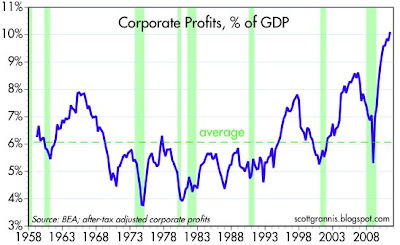 Now corporate profits have soared by 173%, but equity prices have fallen by over 17%. 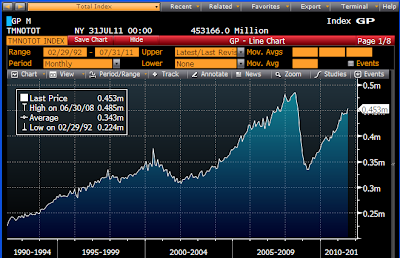 Hold on, you say, it's obvious that equity prices were in a bubble in 2000. Ok, so let's go back to 1995 for purposes of comparison. 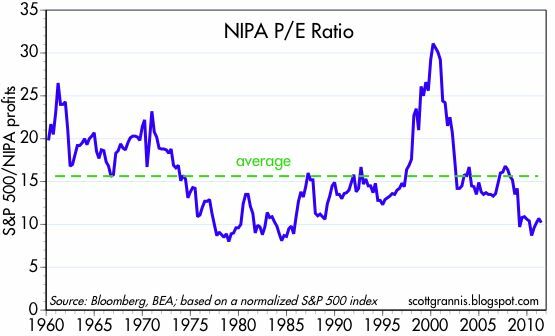 In 1995 the PE ratio of the S&P 500 was 16.5, about equal to its long-term average, and the index averaged about 550 that year while after-tax corporate profits averaged about $500 billion. 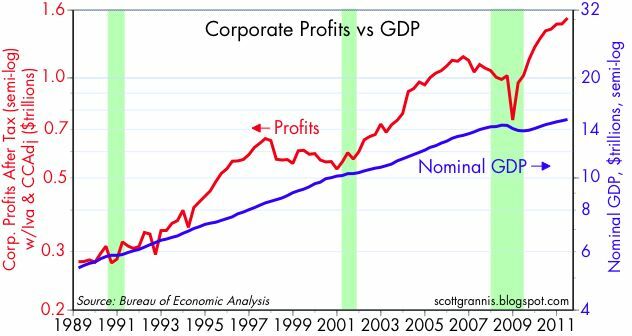 So in the past 16 years, corporate profits have tripled, while the S&P 500 has only slightly more than doubled. There's no getting around the fact that equity prices have seriously lagged the performance of corporate profits. And if you consider that interest rates have collapsed in the past 16 years (the 10-yr Treasury yield averaged 6.5% in 1995, and now it stands at 2.2%), then the lagging performance of equities becomes even more amazing. If the value of equities is a function of the discounted present value of future after-tax profits, then a huge decline in the discount rate ought to result in at least some rise in PE multiples, shouldn't it? But the PE of the S&P 500 today is less than 13, about 30% less than it was in 1995. I've done this analysis every quarter for the past several years, and each time I conclude that the only logical explanation for why stocks are lagging profits is that the market expects a) interest rates to rise and/or b) profits to decline in future years. So far, neither have happened; in fact, interest rates have fallen and profits have continued to rise. Maybe the market has just been looking way ahead to events that have not yet happened, or maybe the market is just way too pessimistic. 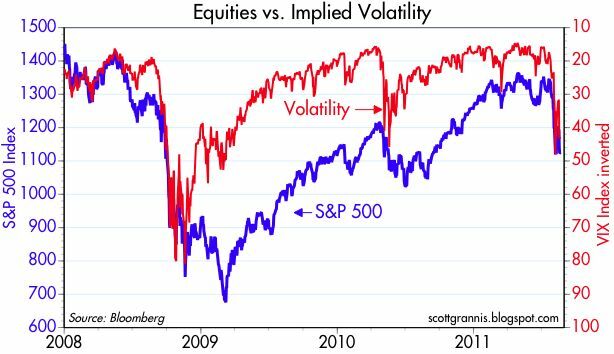 But one thing is clear: it's difficult if not impossible to find even a shred of optimism in today's equity valuations. Here's another way of looking at this. 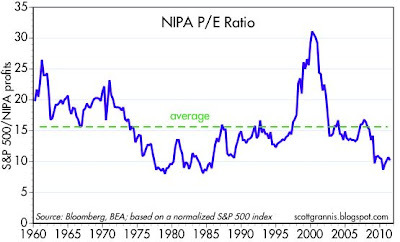 The chart above represents the PE ratio of all corporate equities, using a normalized S&P 500 index as a proxy for the "P" and the National Income and Product Accounts tally of after-tax corporate profits as the "E." PE ratios by this measure are about 10, significantly below their long-term average of 15.6. Stocks are very cheap by historical standards, and the last time they were this cheap, in the late 1970s and early 1980s, was an excellent time to invest from a long-term investor's perspective. Skeptics would counter by saying that this time is different, because 1) politicians are incapable of spending restraint, so taxes are going to rise significantly, 2) the economy is going to be miserable for the foreseeable future, pushing profits way down, and 3) the Fed's super-accommodative monetary policy is going to push inflation and interest rates much higher. Maybe so, but that's about what it would take to justify the current level of prices. Bottom line: you have to be very pessimistic about the future in order to not like equity valuations today. For saying in your Jackson Hole speech today that "most of the economic policies that support robust economic growth in the long run are outside the province of the central bank." And for not promising another round of Quantitive Easing. And for letting us know that you are well aware that "monetary policy that ensures that inflation remains low and stable over time contributes to long-run macroeconomic and financial stability." It's past time for the world to understand that the big fixes now need to come from fiscal policy. Monetary policy has done all it can do to promote an economic recovery, and the Fed's focus going forward should be on ensuring that all the quantitative easing of the past several years doesn't allow the inflation genie to get out of the bottle. Fed Chairman Bernanke is due to speak tomorrow at the Fed's annual Jackson Hole conference. There has been lots of ink spilled about what he is likely to say, with many observers expecting him to either announce, or lay the foundation for, another round of Quantitative Easing or some other measure(s) designed to increase monetary stimulus of the economy. I think this would be a mistake. The economy doesn't need more monetary stimulus, because what stimulus it has already received has done little to stimulate growth but more to stimulate inflation. Moreover, monetary stimulus is a very ineffective—if not useless—tool to stimulate economic growth. You can't manufacture jobs by printing money or making money artificially cheap; all you are likely to get is more speculation, more inflation, and possibly even a weaker economy in the end. Most importantly, however, there is no indication that the economy is starved for liquidity, as there has been prior to the first two rounds of quantitative easing. 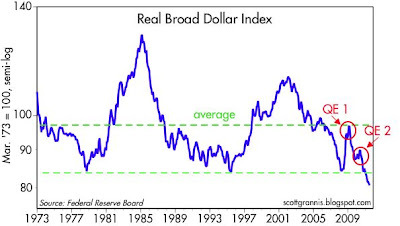 As this first chart shows, the inflation-adjusted value of the dollar against a broad basket of currencies today is as low as it's ever been. This is prima facie evidence that dollars are in abundant supply relative to the demand for dollars. 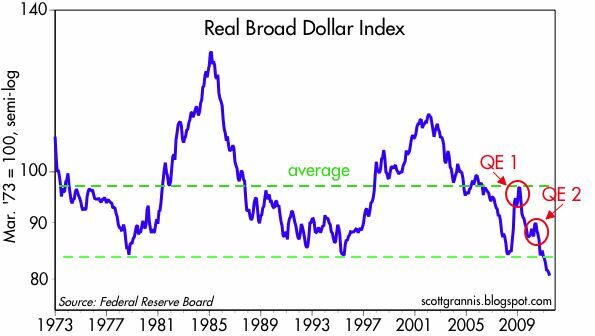 Supplying more dollars to the world by buying more Treasuries or by reducing the interest rate paid on bank reserves would only weaken the dollar further, and eventually that can only stimulate inflation. Note that the first two QE programs were begun at a time when the dollar had risen in value during times of financial stress, which is a good indications that dollars at the time were in short supply. There is a legitimate reason for easing monetary policy when the dollar faces conditions of scarcity. That's not the case today. 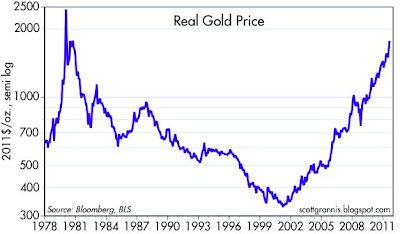 Gold has dropped almost 8% from its recent high, but in real terms and over many decades, it is still at very high levels, as this second chart shows. 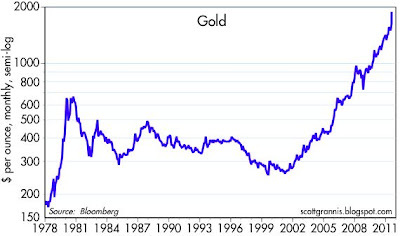 (Note also that gold's current uptrend began in 2001, only days after the Fed announced the first in what would prove to be a long and protracted series of eases.) The world is willing to pay a huge premium for gold for a variety of reasons, one of which is undoubtedly the great uncertainty that has been created already by the Fed's unprecedented efforts to provide monetary stimulus. More stimulus will only validate the gold market's fears, thus increasing uncertainty and speculation, and reducing the likelihood that the world's scarce resources will be directed to productive activities. The Fed's easing efforts are traditionally confined to the front and middle part of the yield curve, because it can directly control short-term interest rates. Therefore, it is necessary to look at the various segments of the yield curve to see how the bond market is reacting to changes in Fed policy. 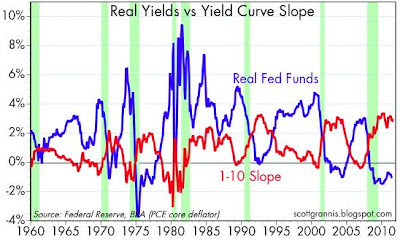 This third chart compares the slope of the Treasury curve from 10 to 30 years with the inflation expectations embedded in the difference between nominal and real yields in the front part of the curve. These two tend to track each other, but not always. 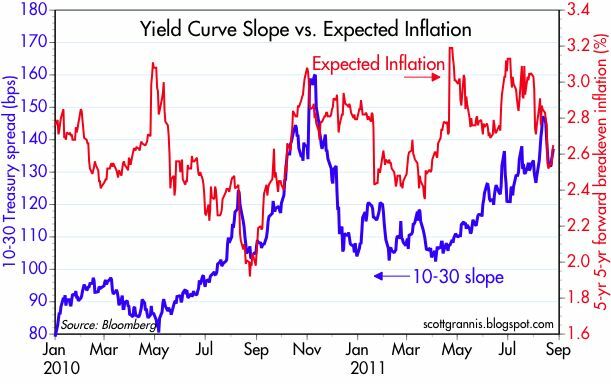 Regardless, comparing today's message with the message that prevailed in late August of last year, it is clear that inflation expectations have risen and the long end of the curve has steepened. Both of these developments are like flashing red lights that caution the Fed against further easing moves. 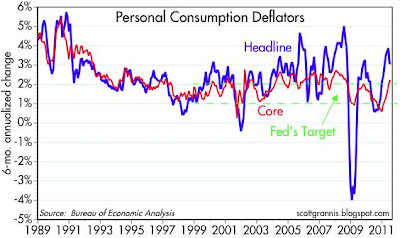 One of the Fed's primary justifications for quantitative easing has been to avoid the risk of deflation. As this fourth chart shows, inflation was indeed quite low at the time it instituted QE1 and QE2, but that is certainly not the case today. By all measures, inflation has moved higher in the past year. According to the PCE Core deflator, which is supposedly the Fed's preferred measure, inflation over the past 6 months was an annualized 2.1%, which is just above the Fed's 1-2% target range. If anything is seriously wrong in the world that needs fixing, it is the problem of sovereign debt in the Eurozone, as this fifth chart suggests. Eurozone swap spreads are trading at very elevated levels, signaling that there is significant systemic risk in Europe, a high degree of perceived counterparty risk (further suggesting that the viability of the banking system is at stake), and the risk of a meaningful slowdown or Eurozone recession. In contrast, U.S. swap spreads are still at relatively benign levels. The problem is in Europe, not the U.S.
Bernanke should not risk the Fed's credibility tomorrow by proposing another round of monetary easing. The facts don't justify it, and the market is not particularly welcoming it either. Further easing would only damage the dollar and risk higher inflation. It's time that the Fed tried a little "tough love" instead of lower interest rates. They should let the world know that while they are concerned about all the world's problems, they don't feel that any further action on their part is justified. What's needed most at this time is less uncertainty and a stronger, not a weaker, dollar. 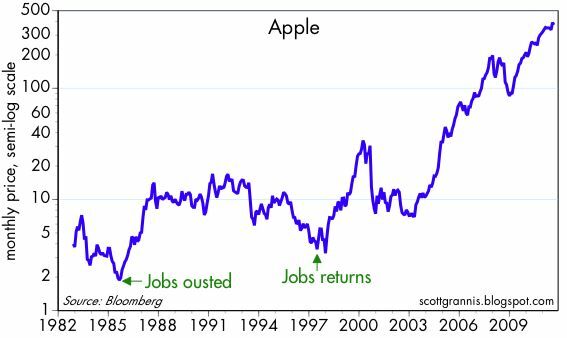 This chart may be the best monetary testament to the greatness of Steve Jobs, who already can claim to be one of the most outstanding entrepreneurs and business leaders in history. As my many posts over the years on the subject of Apple will attest, I'm just as sorry to see him forced to retire as anyone, but I do believe that he has created a culture of excellence at Apple that will endure. His health was obviously not improving, so his resignation was probably inevitable, and therefore it is reassuring to see that AAPL is down only 1% today. The best part of the news of his retirement was what Apple's board did NOT do: they didn't appoint an outsider to succeed him. Tim Cook was the obvious choice, and they got it right. I'm among those who believe that AAPL is still an attractive stock to own. Apple holds a commanding position in a dynamic and expanding industry, and is a proven innovator. Are there any serious competitive threats out there? None so far that I have seen. Google's Android has captured a significant share of the smartphone market, but to date there has been no credible threat from an Android tablet. Android suffers from a significant flaw, since it is virtually impossible for one company to write software that is dynamic, flawless, and competitive on the products of multiple other companies—that's the same source of Windows' ongoing loss of market share to Apple's OS. Nevertheless, it's a good thing there is an Android OS, otherwise the government regulators would likely be attacking Apple for wielding monopoly power. Despite its incredible growth to date, Apple still has only a relatively small share of the personal computer market, and that is quite likely to expand indefinitely. And although Apple has a large share of the smartphone market, it has only a tiny share of the global mobile phone market. Sooner or later, the vast majority of the world's 4 billion cell phones will be smartphones, and that is where Apple has plenty of room to expand further. At the same time, the tablet market is growing like Topsy, and Apple is almost sure to maintain a huge share of that market. And should Apple once again manage to create some entirely new kind of technological marvel, well, then the sky's the limit. With all this potential growth in store, AAPL is only trading at a 14.7 multiple of trailing earnings, and a 13.5 multiple of expected earnings. In other words, the market is plenty cautious about Apple's ability to continue to grow at above-average rates. Since I don't see a credible threat to Apple's ability to expand significantly, then I'm comfortable holding the stock. Full disclosure: I am long AAPL at the time of this writing and have no plans to exit this position. Weekly claims for unemployment (seasonally adjusted) were about 12K higher than expected, but that is not a significant amount. 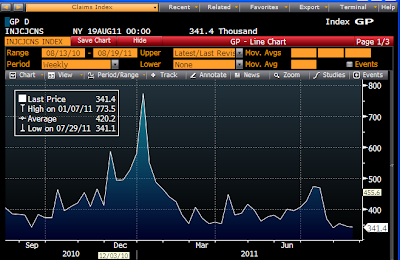 The chart above shows unadjusted (actual) claims, which fell by about 5K. This time of the year the seasonal trends are not particularly pronounced, so small variations like these are likely just random—not indicative of any meaningful change in the economic fundamentals. Comparing this week to the same week a year ago, claims are down a little over 10%, and that is the story to focus on: slow, but gradual improvement over time. Gradual improvement in the state of the labor market also shows up in this chart of the number of people (actual, not seasonally adjusted) who are receiving unemployment benefits. The total has now dropped to a new post-recession low of 6.64 million, and that is down almost 2.5 million from the same week a year ago. The number of people working has increased by about 1.3 million over the past year, so that implies that over a million of the people who have dropped off the unemployment claim rolls are still looking for a job. That's a sorry state of affairs, but at least it means that the government is no longer subsidizing their job search. Life can be difficult at times, but government can't and shouldn't try to take care of everyone who runs into adversity. 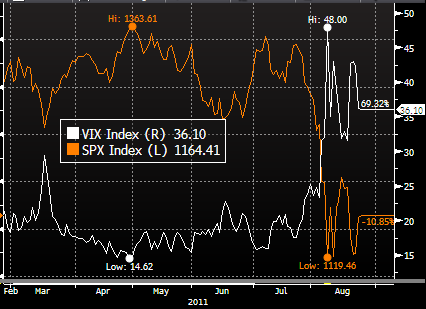 In my earlier post today, I noted the very strong negative correlation between the Vix index and the S&P 500. Here's an illustration of another very strong negative correlation (-0.92), between the price of gold (white) and the yield on 30-yr Treasuries (orange). Very low Treasury yields are symptomatic of a market that is terrified of the outlook for growth and the possibility of deflation. 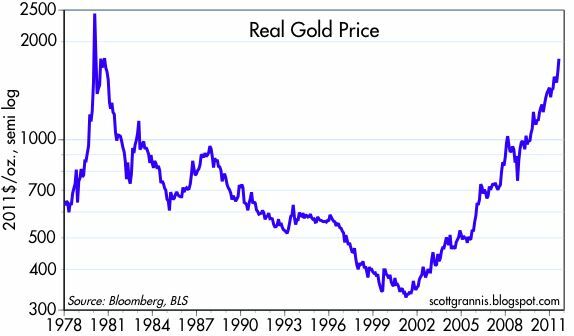 Very high gold prices are symptomatic of a market that is terrified of all sorts of things, and very weak growth accompanied by expansive monetary policy which could lead to high inflation is just one. The extreme volatility and relative weakness of equity prices is symptomatic of a market that is extremely worried about the outlook for growth. When emotions run high and confidence is low, prices can reach levels which don't make much sense. 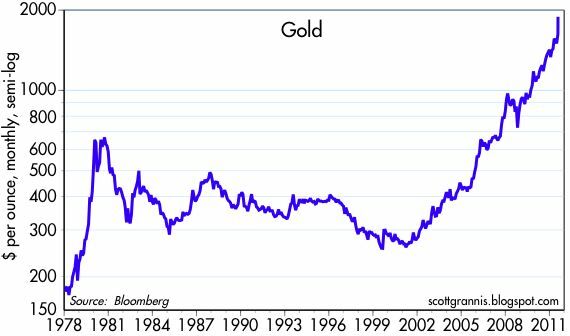 Such is the case with the seemingly inexorable rise of gold prices (typically associated with rising inflation risk) and the seemingly relentless decline of long bond yields (typically associated with very low inflation or deflation). It should be easy to deduce that one or both of those markets was likely to be proved wrong. The big reversal we saw today, with gold prices falling 8.5% from yesterday's all-time high, and 30-yr Treasury yields rising 25 bps from yesterday's post-2008 low, is a perfect example of what happens when two trends which were inevitably and mutually unsustainable collide with even the slightest bit of reality: business investment continues to rise and inflation is by no means dead. Here's a chart that should strike fear into the hearts of Keynesian economists. 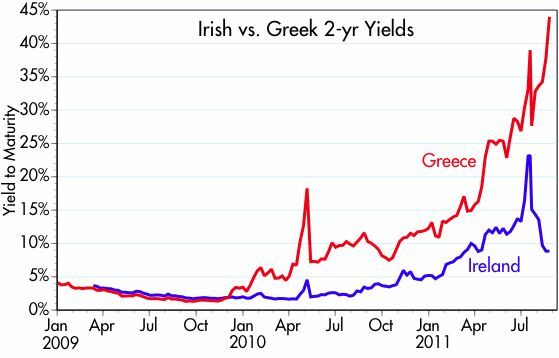 It compares the yield on 2-yr Irish and Greek sovereign debt, one of which has soared, while the other has plunged. Both face massive deficits: one country's deficit/GDP ratio is 10.5%, while the other's is perhaps the worst on the entire planet: a staggering 32.4%, according to Bloomberg. Can you guess which is which? Wrong. Ireland has the worst deficit/GDP ratio, but its prospects for recovering are much better than Greece's, mainly because Ireland has decided to tighten its belt and adopt genuine austerity measures that reject tax hikes (Ireland has steadfastly refused to pay attention to the EMU's entreaties to raise its corporate tax rate to a level more consistent with other countries) in favor of spending cuts. Ireland has decided to bite the bullet, and they are doing it in convincing fashion. 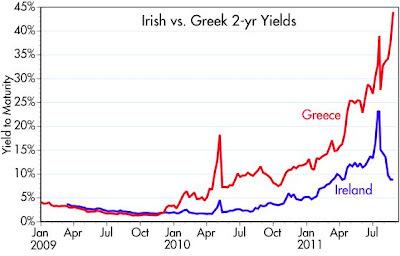 This gives markets the confidence they need to prefer Irish debt to Greek debt, and by a huge margin. The U.S. debt problem is no more complicated than Ireland's. All we need to do is take convincing steps to rein in spending while eschewing tax hikes. That improves the outlook for growth, and that in turn provides a bedrock of confidence. Why should Keynesians be worried? Because this is concrete proof that cutting spending and keeping taxes low can actually improve a country's economic outlook. This chart compares the behavior of the S&P 500 index (orange) to the Vix index (white). The correlation between the two has been almost perfectly negative: -0.95. Which is to say that the recent declines in equity prices this year have been accompanied almost exactly by rises in fear, uncertainty, and doubt. Perhaps in the fullness of time we will see that declining equity prices were a response to a deterioration in the economic fundamentals, but for now the only thing that is clear is that the decline has simply been the flip side of a rise in sheer terror. 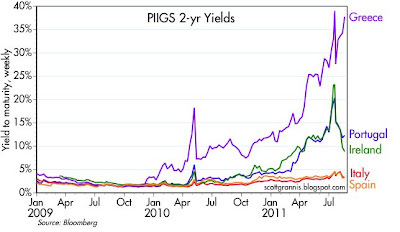 As I've suggested before, the terror is likely being sparked by concerns that a PIIGS default could wipe out the European banking system and that, in turn, could bring down the entire global economy. Were these fears to be allayed for whatever reason, it follows that global equity prices would enjoy substantial upside gains. To get a rally, we just need to avoid a catastrophe. 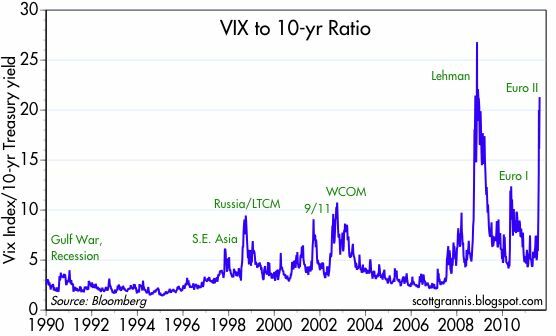 For a more detailed explanation of how big Vix spikes have tended to come in pairs, to be followed by equity rallies, I refer you to this post at Vix and More. 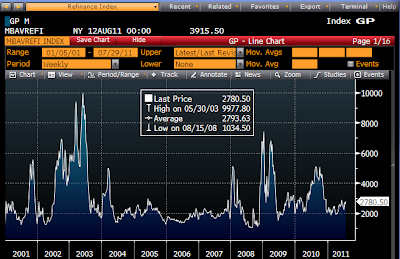 For more insights into how the Vix index works, see this post. Meanwhile, here's an update on the source of all these fears. 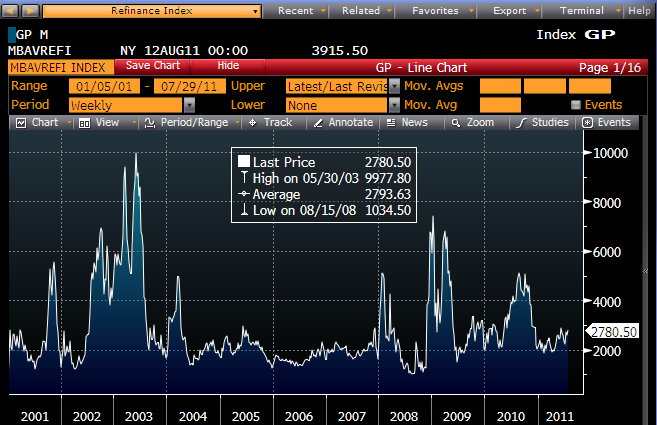 A significant Greek default is now all but certain (we've known this since at least last April). The risk of contagion is reflected in Portguese and Irish bonds, but together they owe a bit less than Greece does ($500 billion), and their chances of default are substantially less: Greece CDS today are trading at 2300, while Portugal and Ireland CDS are 1060 and 866, respectively. 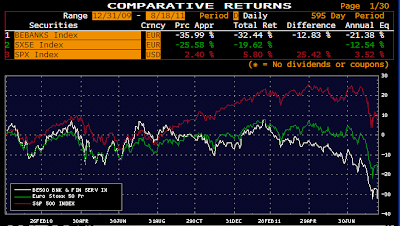 Italy and Spain CDS are trading around 380, which is equivalent to the low end of investment grade corporates. So catastrophe—which would take the form of a meaningful default on Italy's $2.3 trillion debt—is far from imminent. New orders for capital goods fell as expected in July (they almost always do in the first month of each quarter), but the 3-mo. moving average (which corrects for this problem) continues to rise. However you measure it, orders are up 10.8% over the past year, they are still rising, and they are closing in on the pre-recession highs. Double-digit growth in business investment is hardly the stuff one would expect to see if the economy were flirting with recession, or if this were a jobless recovery or a New Normal economy, as so many seem to think. Nevertheless, it continues to be the case that the recovery is sub-par, but it's not entirely the fault of the private sector. It is probably more accurate to say that the private sector is doing a pretty good job of growing the economy despite all the obstacles thrown in its path: e.g., trillion-dollar deficits which have soaked up every penny of record-setting corporate profits in the past two years, and huge increases in transfer payments which penalize work and reward idleness. Today's WSJ op-ed page has two more examples if you fail to see my point: "Rahm's Home Improvement," and Robert Barro's piece (which should be required reading in all Econ 101 classes), "Keynesian Economics vs. Regular Economics." If left to its own devices, the economy would undoubtedly be doing a lot better. 10% annual growth in business investment is pretty darn good, but the drag from misguided fiscal policy puts us in a "two steps forward, one back" mode. Not me, my oldest daughter is in the process of delivering her third son and our fourth grandson today, so no blogging. UPDATE: A big healthy boy was born today, and mother and child are resting peacefully. Grandparents are a bit tuckered out, even considering that for me this was the eighth delivery I have attended. Thanks for all the well-wishes! 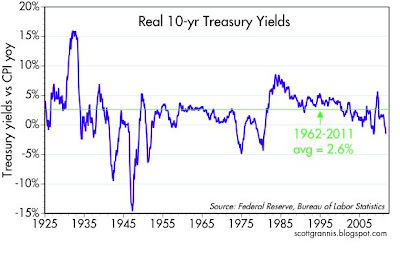 The yield on the benchmark 10-year TIPS [recently] turned negative for the first time in history, meaning investors are now lending money to the government with the hope of receiving a sum 10 years from now that is worth less in purchasing power than the dollars they fork over today. This astounding situation can only be justified by extraordinary pessimism about the prospects for the U.S. economy. Economic theory predicts that the real yield on long-term TIPS should approximate the real growth in the economy. 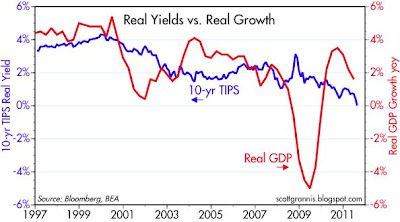 The chart above illustrates that the real yield on 10-yr TIPS has indeed tended to track the real growth of the economy. 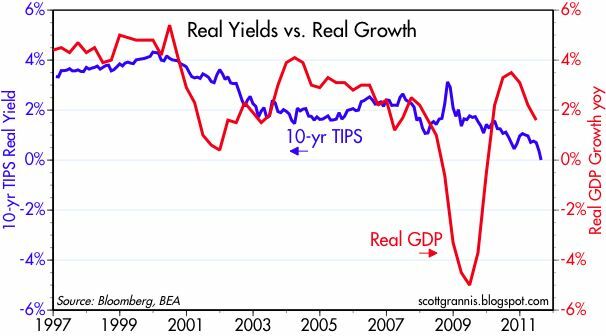 Note that in the early years when TIPS were first issued, real yields were very close to the economy's real growth performance in the go-go years leading up to the 2001 recession. Following the 2001 recession, real yields settled in at around 2%, foreshadowing the relatively subdued recovery that followed, and the modest growth that led up to the 2008 recession. Now real yields have plunged to zero, suggesting that real growth going forward is going to be either nonexistent or quite dismal. This is indeed troubling, considering that the economy is currently operating about 10% below its potential, or long-term growth trend. Without growth, the unemployment rate, which is still exceptionally high, could reach depression-era levels in the years to come. 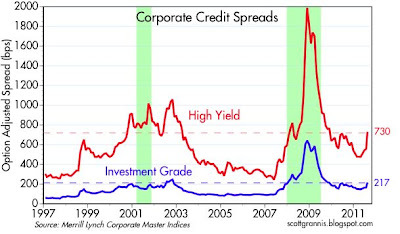 Siegel and Schwartz go on to note that despite the economy's recent difficulties, corporate profits are at record levels, and that dividend yields are likely to rise over time even if the economy struggles and even if our debt woes lead to more inflation, thus making dividend-paying equities an attractive alternative to the deep pessimism built into bond prices. 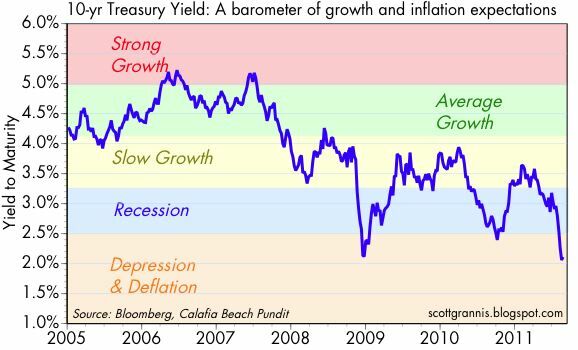 Looked at from another perspective, if the economy merely avoids a recession or depression, then Treasury and TIPS yields are likely to rise significantly. These charts include data for Q2/11 that was released today. What they show is a dramatic improvement in consumers' credit card health. 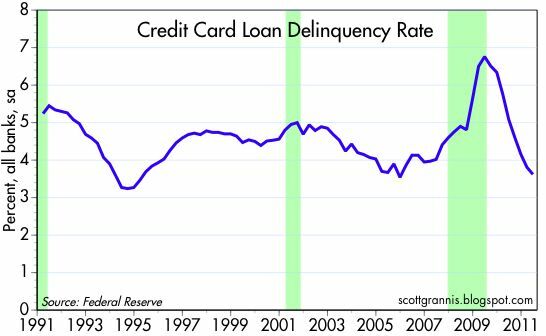 Delinquency rates have plunged to close to the lowest levels seen in the past 20 years, and that presages further declines in credit card chargeoff rates. 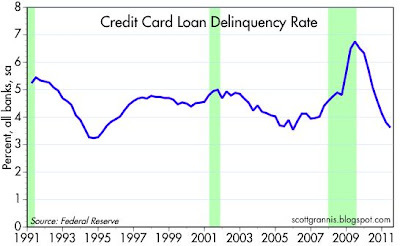 (Since delinquency rates are still declining, we are likely to see chargeoff rates decline in the future, since borrowers that eventually go bust must first become delinquent.) From this we can infer that not only have consumers undergone some significant deleveraging, but that incomes and debt service have now come back into some semblance of balance. 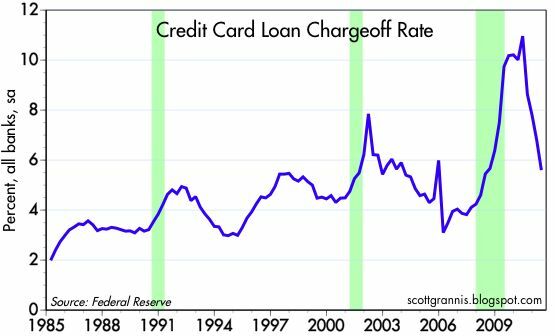 Moreover, banks can look forward to lower credit card losses. Judging by the behavior of gold (now at another high of $1890 and looking parabolic), the equity and corporate debt markets (equity prices down 17% from recent highs, credit spreads surging), the Vix (registering significant levels of fear at 41), and the 10-yr Treasury yield (now priced to levels suggesting a deep recession or even depression), the world seems awfully afraid that the simmering European debt crisis is about to reach full boil—bringing with it the end of the world as we know it, or at the least another deep and painful recession. On balance, these indicators of market fears, sentiment and expectations haven't been this awful since late 2008, when the global economy was in virtual free-fall. 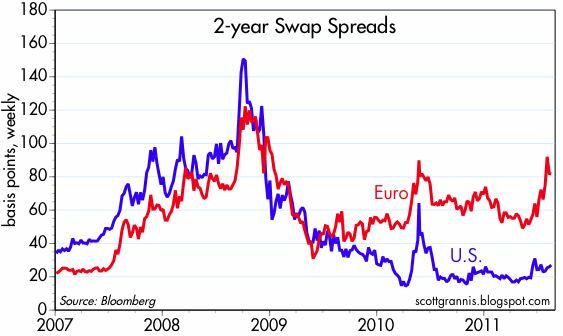 Those fears seem way overblown, however, since U.S. swap spreads, while up a bit from their recent lows, are still within the range of what could be considered "normal." European swap spreads are signaling pain ahead for Europe—at the very least a Greek default, some bank failures, and perhaps a recession—but US swap spreads are still consistent with a view that the US banking system and economy will be largely insulated from whatever problems Europe does suffer. Swap spreads have played the role of "canary in the coal mine" quite a few times in the past decade or so. 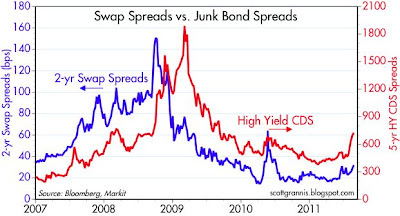 Note, for example, in the second chart above how swap spreads led high-yield CDS spreads in advance of the 2008 recession and in advance of the 2009 recovery. 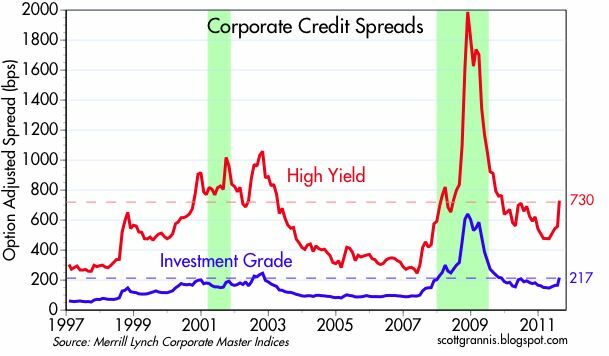 What swaps are saying now is that default risk and recession risk are way overblown; that what we are likely seeing today is one more case of investors that have been burned so badly in the past that they can't bear even the thought of another recession. Those fears also seem way overblown given what we know about the economy. The problems of 2008 were exacerbated by $150 oil, but today oil is trading well below $100. Real interest rates were quite high in advance of the 2008 recession, but today they have been negative for almost three years. The yield curve was flat to inverted prior to the 2008 recession, but has now been steeply sloped for almost three years. Inflation plunged in the second half of 2008 as the world's demand for liquidity surged and the Fed was late to respond, but today all measures of inflation are moving higher, there are no signs of any liquidity shortage (e.g. the dollar is very weak, gold and commodity prices are quite strong), and the Fed has pumped $1.6 trillion of reserves into the banking system. Employment collapsed in 2008 and 2009, but jobs have been growing for almost 18 months now. 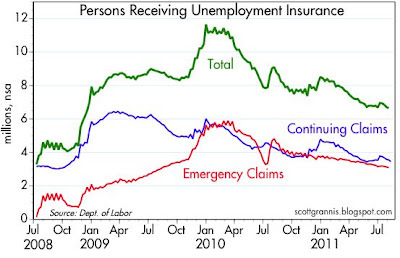 Weekly claims for unemployment surged in 2008, but have been declining for the past two years. Confidence and valuation multiples tumbled as the 2008 recession unfolded, but today confidence has been weak for years and PE ratios are well below average. I've seen people say that since the economy has barely grown the past two quarters, the economy is like a plane that is nearing "stall speed" and is thus in danger of crashing. But that analogy seems absurd to me. What law says that if an economy doesn't grow it therefore has to collapse? That may be true for individual companies (i.e., if you don't grow you will eventually die or be overtaken by the competition), but it's not true for economies, which can and do languish for long periods. In any event, recessions are the exceptions, not the rule—it takes extraordinary circumstances and policy mistakes to generate a recession. Europe has plenty of problems, with public sector obesity and over-indebtedness topping the list. But that doesn't mean the end of the world as we know it is inevitable. The money that the PIIGS have borrowed has been spent and much of that spending was wasteful; those losses happened long ago and they are now water under the bridge. What remains to be seen is whether the consequences of those losses (which might be manifested in a series of bank failures) will bring down the European and global economies. In the meantime, governments everywhere are facing intense pressure to trim spending (a very good thing), U.S. swap spreads are saying things are still OK, and commodity prices are saying the global economy is still humming along. I keep updating this chart because it represents good news that is not getting enough attention, especially these days with the banking panic in Europe and the mad scramble for safety that has pushed 3-mo. T-bill yields to zero. The story here is that for almost one year now, banks have been increasing their lending to small and medium-sized businesses; over the past six months, C&I Loans have increased at a 9.1% annualized rate. That's fairly impressive, and it directly contradicts the notion that the economy is being depressed because everyone is still trying to deleverage. It's not that more loans are good per se, it's that more loans are prima facie evidence that risk-aversion is on the decline. After all, it takes someone willing to accept risk before you can have productive investments that grow the economy. Companies are more willing, on net, to leverage up, and banks are more willing, on net, to lend more. It further suggests that the stress that is punishing the Eurozone banking system is not spreading to the US. There is hope for the future. Judging from the rising yields on 2-yr Greek debt, Greece is very likely to default, and the likelihood of a significant default has only been rising in recent weeks. 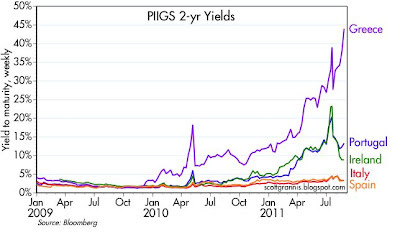 The prospect of a Greek default (which at this point would likely be equivalent to a "haircut" of 20-30% on its outstanding $500 billion of debt) has resulted in considerable angst in the financial markets, primarily because of the fear that if one of the PIIGS defaults, then others might too, and at some point (especially if Italy, with over $2 trillion of debt, were to default) the losses might overwhelm the eurozone banks, which own an awful lot of the stuff. The above chart shows the Euro Stoxx Banks index, which rather dramatically illustrates these fears: the market value of Eurozone banks has fallen 78% from the 2007 highs; current values are down 45% from their 2011 highs; and current values are only 26% above their March 2009 lows. According to Zero Hedge, the decline in the market cap of the Euro banks from their 2007 highs now exceeds $1 trillion. Bad debts, in other words, have already wiped out one trillion dollars worth of Eurozone bank capital, and there's only $440 billion left. The escalating losses being inflicted on Eurozone banks have likely sent over a half trillion dollars fleeing to the US banking system, as I discussed in a recent post. 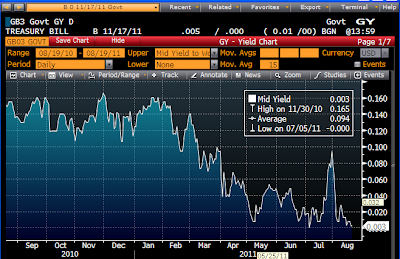 Such is the demand for US safe havens that the yield on 3-mo. 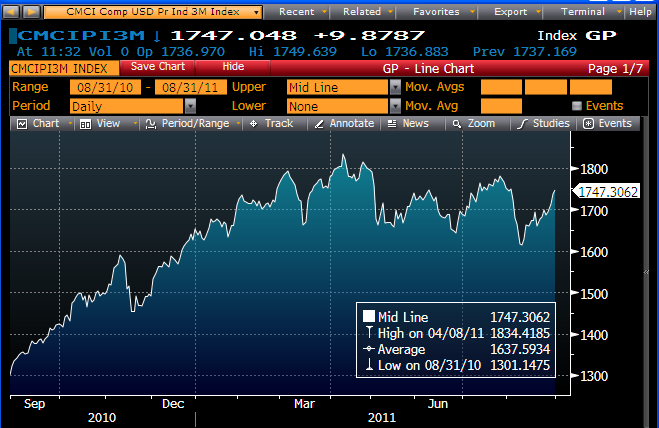 T-bills has been approaching zero for the past two months (see chart above). There is still reason to avoid outright panic, fortunately. 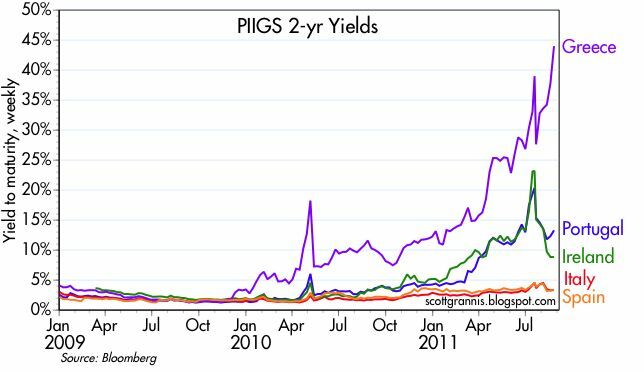 As the top chart also shows, yields on non-Greek PIIGs debt have declined meaningfully in recent weeks. Whether this is due to ECB purchases of PIIGS debt, or to the conservative shift in the political winds in Europe is hard to say. But it becomes clearer every day that the underlying source of most of the world's problems these days is an obese public sector: too big, too inefficient, too intrusive, too burdensome, too regulating, too indebted, and too unionized. If the disease can be properly diagnosed, then there is reason to hope for a cure. But please, hold off on the tax hikes. We need to starve the beast, not feed it more. 30-yr fixed mortgage rates have never been lower than they are today, thanks to record-low yields on Treasuries, a weak housing market, and plenty of loanable funds sloshing around the world's capital markets. For all those who can qualify for a refi, this is one more opportunity of a lifetime. Refinancing activity understandably has surged in recent weeks and is likely to continue, though it seems unlikely we'll exceed the high that occurred in late May 2003 (see above chart of the Mortgage Bankers' Association Refi Index, whose latest value is 3915). That high occurred thanks to a plunge in 10-yr Treasury yields to almost 3%, which in turn was driven by the market's belief that the economy was mired in a jobless recovery. As history buffs will recall, the Bush II tax cuts were passed in June '03, and the economy subsequently staged a surprising recovery which vaulted 10-yr yields back up to 4.6% by the end of the summer. It would be wonderful to see history repeat itself. 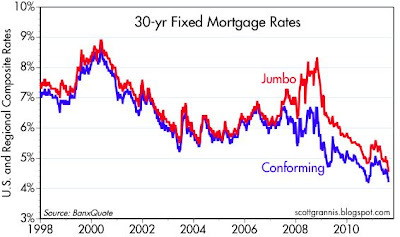 UPDATE: Mark Perry has a collection of other interesting mortgage-related statistics here. This chart goes a long way to explaining the source of stock market angst in the past several months. The red line is the total return on the S&P 500 index, the green line the total return on the Euro Stoxx index, and the white line the total return on Bloomberg's Euro Banks and Financial Services index. 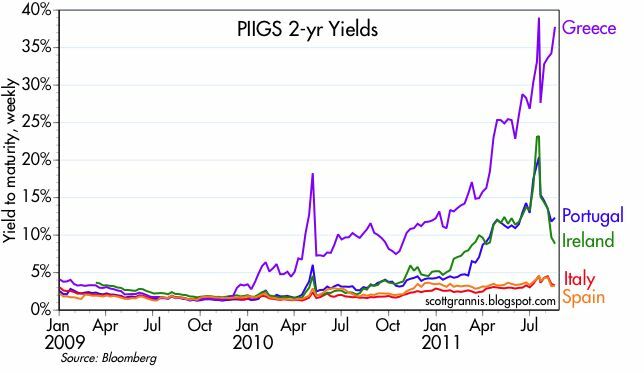 Bottom line, Eurozone banks are getting crushed by fears that their holdings of PIIGS debt will wipe them out should a Greek restructuring prove contagious, and those fears are spreading to all markets around the world. By comparison, the U.S. is holding up far better than most. 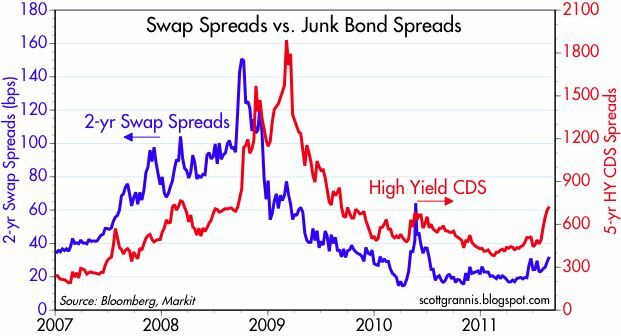 Swap spreads confirm that there has been no material deterioration in the health of the U.S. banking system or financial markets, with spreads still at levels that reflect no unusual degree of systemic or counterparty risk. 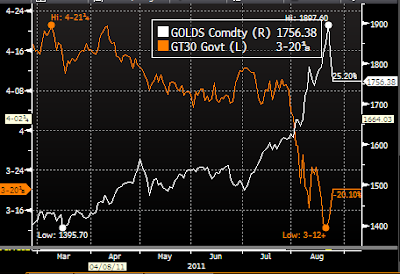 The problems are concentrated in Europe, where counterparty and systemic risk remain quite elevated. So there are two key and related questions: Will a Greek default/restructuring bring down the Eurozone banking system? Will a collapse of the Eurozone banking system, bring down the U.S. and/or the global economy? Nobody has an answer to those questions, but to judge from market behavior, investors are becoming extremely concerned that a worst case scenario is in the offing. ... the 2012 elections will be a referendum on democracy itself, a contest between Plato and Protagoras. It will show whether a critical mass of American voters are able to see beyond their own private interests and make decisions that, while causing themselves some pain, are nonetheless necessary for the long-term fiscal health of the country—or whether, consistent with the ancient critics of democracy and the fears of the founders, they will choose instead a government that uses its power to benefit those who are, as Polybius put it, "habituated to feed at the expense of others, and to have [their] hopes of a livelihood in the property of its neighbors." There can be no two opponents more suited to engage in this upcoming battle over the future of our country than Barack Obama, the most fervent advocate for a bigger, more redistributive government, and Paul Ryan, the most articulate spokesman for limited government, individual freedom, and the need for entitlement reform. Here's hoping that Paul decides to run for President. As this chart of 10-yr Treasury yields and the year over year change in Core CPI suggests, the Treasury market is zigging when it should be zagging. Yields have plunged on fears of a double-dip recession, which in turn are being driven by fears of a financial market meltdown in Europe. The fears embodied in today's 2.0% 10-yr Treasury yields eclipse even those that prevailed at the end of 2008 when markets were convinced that The End of the World As We Know It was just around the corner. While there are certainly many things to worry about, one of which is the half-trillion dollar run on European banks that I discussed a few days ago, I think that fear has been trampled by panic these past few weeks. There has been no deterioration in the fundamentals of the U.S. economy. Things are far from perfect, to be sure, since we are suffering from monetary policy which is too easy and fiscal policy which is smothering the private sector, the combination of which has resuscitated a moderate form of the 1970s stagflation. But even then it was not the end of the world, as the economy managed to grow 3.3% per year on average during that otherwise-awful decade. The July CPI rose by more than twice as much as had been expected (0.5% vs. 0.2%), while the core CPI rose by 0.2% as expected. 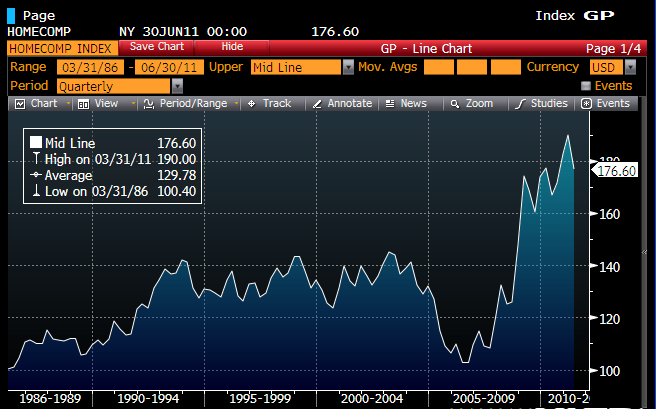 The trend in inflation by just about any measure is up. Over the past six months, the CPI is up at a 4.0% annualized rate, and the core CPI is up at a 2.6% annualized rate. That both measures are rising is a testament to the fact that monetary policy is accommodative. 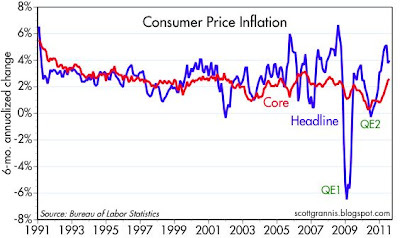 It is also a testament to how wrong the conventional thinking is about what causes inflation. 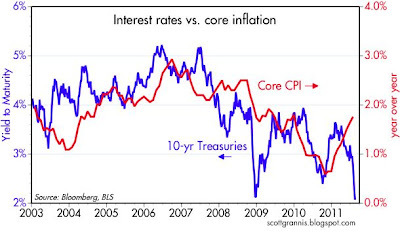 Inflation was not supposed to be nearly as strong as it has turned out to be, since the economy is operating at least 10% below its trend capacity, and according to Phillips Curve doctrine, an economy with so much "slack" or idle resources should be dangerously close to, if not already mired in, deflationary quicksand. 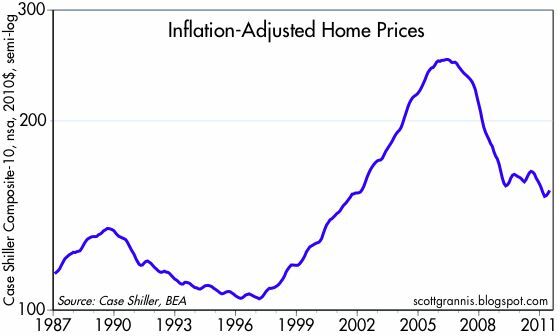 Instead of deflation, we are experiencing what so far could be called a mild-to-moderate case of stagflation: a weakly growing economy with rising inflation. This is the same sort of condition that characterized much of the 1970s. Both eras have some common monetary denominators as well: accommodative monetary policy, a weak dollar, low to negative real interest rates, and strong gold and commodity prices. Once again we are seeing proof that easy money doesn't stimulate growth, it just stimulates inflation. 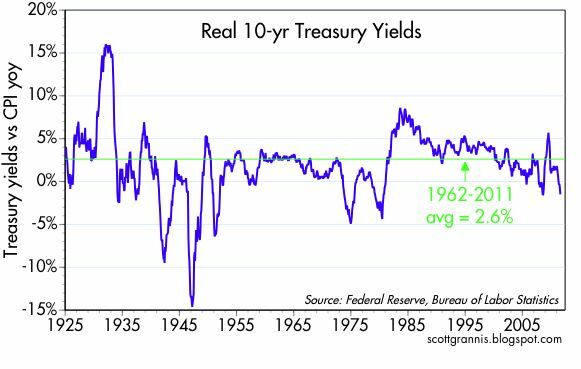 Note in the above chart that when real yields were below their long-term average (e.g., from 1965 through 1980) inflation was generally rising. When real yields were above average (from 1980 through 2000), inflation was generally low and falling. As I explained in detail yesterday, low real yields are symptomatic of easy money, and they are part of the rising inflation process. 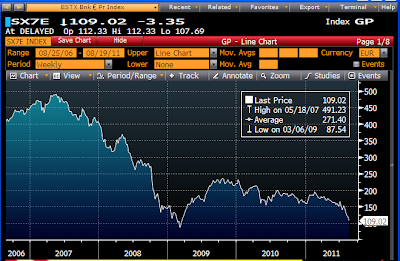 Please, Mr. Bernanke, take away that punchbowl! We don't need any more spiked Kool Aid.